What an amazing debut from Margot Hunt! Best Friends Forever immediately opens with a bang and I was completely captivated within minutes. The novel is extremely well written and constantly leaves the reader guessing who should be trusted. I absolutely loved the twists and thrills in this novel and totally did not guess the ending, even though there were times I thought I would be able to. I loved the characters in this novel. Hunt did a fantastic job creating Alice and Kat, and I could picture them perfectly in my mind. Alice appeared to be meek and mild while Kat was the rich and glamorous friend who always got what she wanted. I thoroughly enjoyed diving into their relationship and it was truly interesting to see how they reacted to one another. I also loved the back and forth between present day and the past. The transitions were always very smooth and left me on the edge of my seat. 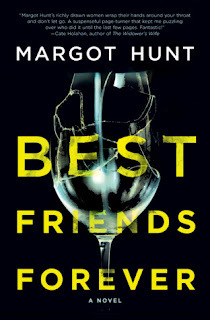 Best Friends Forever is an incredibly impressive debut novel from Hunt and I look forward to reading more from her in the future. This novel was full of thrills and surprises, and I would highly recommend it to readers who enjoy psychological thrillers. I was pleasantly surprised with how much a enjoyed this novel and I am very thankful to NetGalley and Mira for sending it in exchange for an honest review.